In the late 1930’s, the San Francisco News hired a young novelist, John Steinbeck,to write a series of articles about the migrant workers who had left the dust bowls of the southern plans to look for a better life in California. Steinbeck’s newly published Tortilla Flat, a series of humorous stories about Monterey paisanos, was already receiving national acclaim. 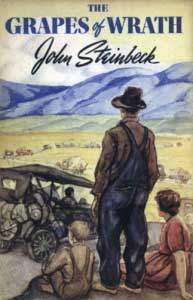 He wrote a seven-part series which he called “The Harvest Gypsies.” But while researching that series, Steinbeck’s imagination was captured by the people themselves. As a result, those articles became the foundation of what is considered by many to be his greatest work, The Grapes of Wrath, published in 1939. This was followed by a series of successful novels, the last being Travels with Charley, a travelogue published in 1962 in which Steinbeck wrote about his impressions during a three-month tour in a truck that led him through forty American states. He was awarded the Nobel Peace Prize in Literature in 1962. He died in New York City in 1968.